The Trump rally has come in three waves. It was kicked off soon after the election with exuberance over the Trump agenda. It was dealt a blow by political reality, and has since matured into cautious optimism. All in all, the stock market performance through President Trump's 100th day in office on Saturday looks impressive. That's especially true given Trump's historically-low poll numbers and nonexistent legislative achievements, at least so far. The S&P 500 has rallied 11.6% between Trump's election victory and Friday, the final day before the 100-day mark. 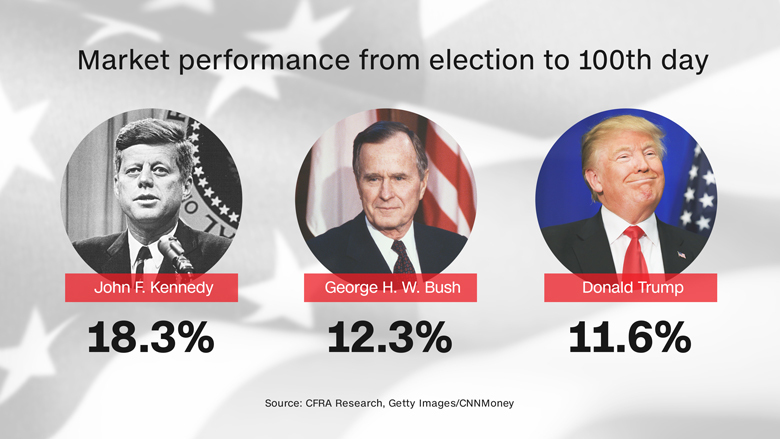 That's the second-best performance for that period, since an 18% surge under President Kennedy in 1961, according to CFRA Research. The S&P 500 soared 12.3% through the same point under President George H. W. Bush in 1989. "Wall Street has awarded President Trump an A for 'anticipation,'" Sam Stovall, CFRA's chief investment strategist, wrote in a report. Anticipation of a pro-growth policy -- massive tax cuts, infrastructure spending and deregulation -- fired Wall Street up immediately after the election. So much so that most of the Trump rally actually took place long before he ever took power. Roughly 53% of the S&P 500's total post-election rally happened by December 13, according to an analysis of FactSet data. "The chunk of time between election and inauguration was filled with irrational exuberance," said Art Hogan, chief market strategist at Wunderlich Securities. Banks like Goldman Sachs (GS) and Bank of America (BAC) skyrocketed more than 30% apiece between Election Day and mid-December on hopes of faster growth, higher interest rates and deregulation. "We did a moonshot on the financials, because they were a posterchild for everything the new administration wanted to do," said Hogan. 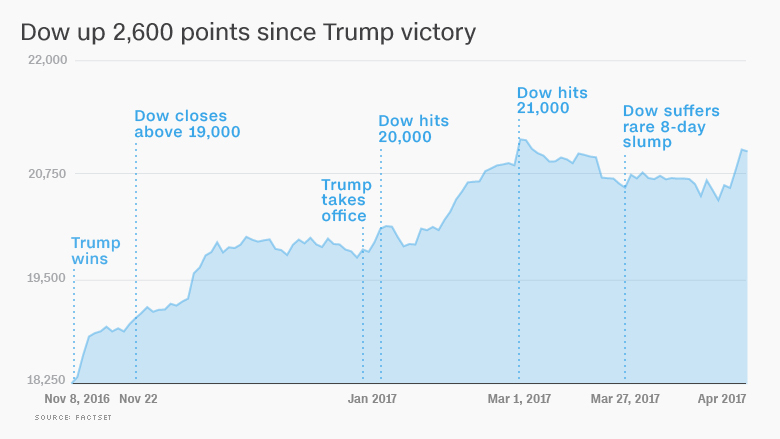 Eventually the Dow would cross over the 19,000, 20,000 and 21,000 milestones -- and Trump actively cheered for it to go "up, up and up." But then Wall Street's hopes for a swift enactment of the Trump agenda were dashed, by notoriously slow-moving Washington. Trump's early focus on health care -- and insistence it come first to create tax savings -- blew up when a bill to repeal and replace Obamacare failed to even be brought to a vote. "Suddenly reality set in. What can actually get done?" said Thomas Digenan, head of US intrinsic value equity at UBS Asset Management. That realization spooked the market a bit, sending the Dow into an eight-day losing streak, its longest since 2011. CNNMoney's Fear & Greed Index flashed "fear" and even briefly flipped into "extreme fear." "This stuff is always harder to do in real life than it is on the campaign trail. That's why you had a slowdown in the market," Digenan said. But the market retreat was brief and stocks have since resumed their upward trajectory. The Nasdaq even topped the 6,000 mark for the first time ever this week. 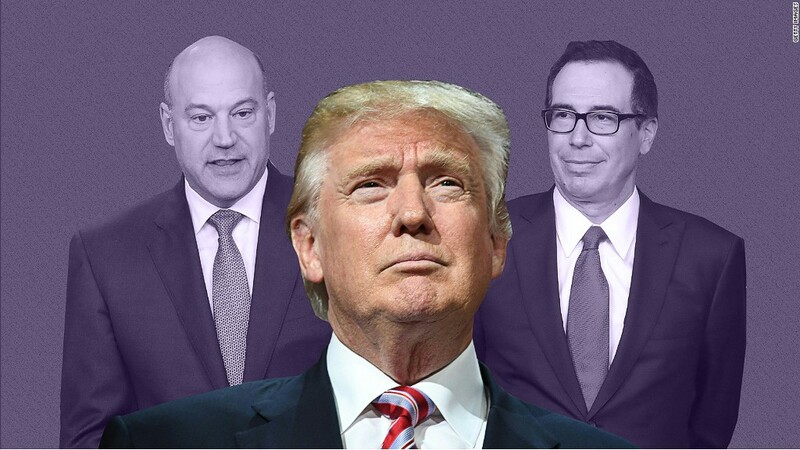 Wall Street has been reassured by Trump's pivot to tax reform -- the central pillar of the administration's economic platform. The White House finally gave a blueprint this week for a tax deal and is pushing for a 15% corporate tax rate. Investors are no longer banking on a tax deal by August, but there is cautious optimism one can be reached by early 2018. Sweeping tax reform would go a long way to justifying the rally since November -- and lofty stock valuations. Wall Street is also encouraged by Trump's more pragmatic stance on some campaign promises. For instance, Trump has declined to call China a currency manipulator in an effort to get Beijing to help pressure North Korea. Trump also recently backed down from an insistence to include funding for a border wall with Mexico in the spending bill needed to prevent a government shutdown on Saturday. "It feels like instead of the man shaping the office, the office is shaping the man. That's a positive," said Hogan. "The more pragmatic this administration becomes, the more the market will like it," he said.